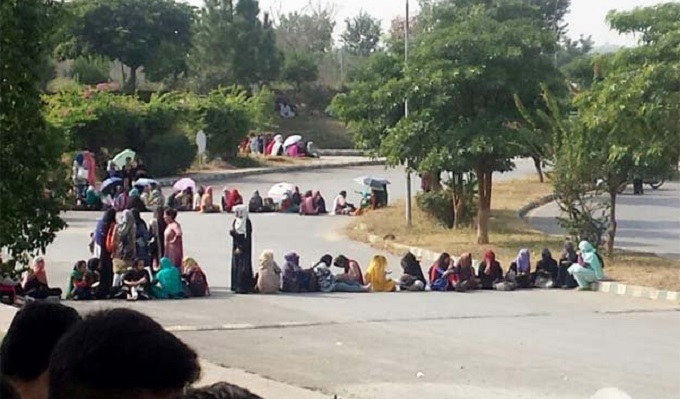 The female students of the International Islamic University Islamabad (IIUI), Islamabad staged protest over the restrictive campus ambiance and pointless launched restrictions by the varsity administration. The female students of the university have protested against the newly announced brand new gown code for women and restrictions imposed on their unnecessary movement in the boys’ campus. A large number of students held walk from the female campus to security office, where they blocked the main avenue for one hour demanding an end to gender discrimination in the campus. The University recently revised dress code for women, directing them to wear shalwar kameez with a shirt that is at least knee length and trousers with long shirts, and dupatta or scarf is mandatory with all dresses. The students viewed that they are continuously being victimized by the university administration and humiliating rules are being introduced creating a suffocating environment for them in the university. The college maintains strict segregation between the female and male campuses which run parallel. This time, several protesting students raised their voices with placards and protests. 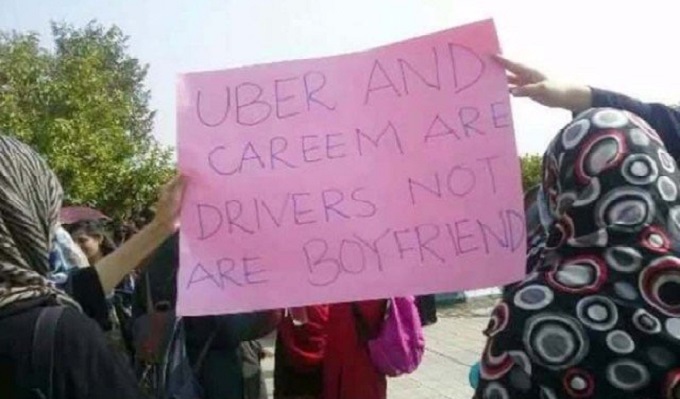 “Uber and Careem are drivers, not our boyfriends” yelled one placard. A student Ammara while talking to media said that administration imposes restriction not to go outside the university without permission on the slip from the chairman. She also complained about the discriminating attitude from security guards on entry and exit points. The protesting female students demanded that the security guard who had misbehaved with students should be suspended, the bookshop and international café should be reopened for female students. Another student, Mahnoor Fatima said that administration repeatedly issues humiliating notifications for female students. “They see everyone with suspicion and pass inappropriate remarks and even taunt whenever a student leaves the campus before 2.30pm,” said a protesting student. Rector IIUI Prof Dr Masoom Yasinzai while responding to the protest said that the administration has withdrawn the notification of permission slip system after observing student demands. He further said that new dress code is according to the norms and culture of the society as the university is trying to provide best facilities to our students. Rector University also said that best gym facility has been provided to female students, the female students have equal liberty like the male students in the campus.